As time progressed, Pixar received criticism for not having any films with female lead characters. Pixar had strong female characters, such as Helen Parr/Elastigirl and Violet in “The Incredibles,” Sally in “Cars,” EVE in “WALL-E” and Colette in “Ratatouille,” but none of the lead characters had been women. 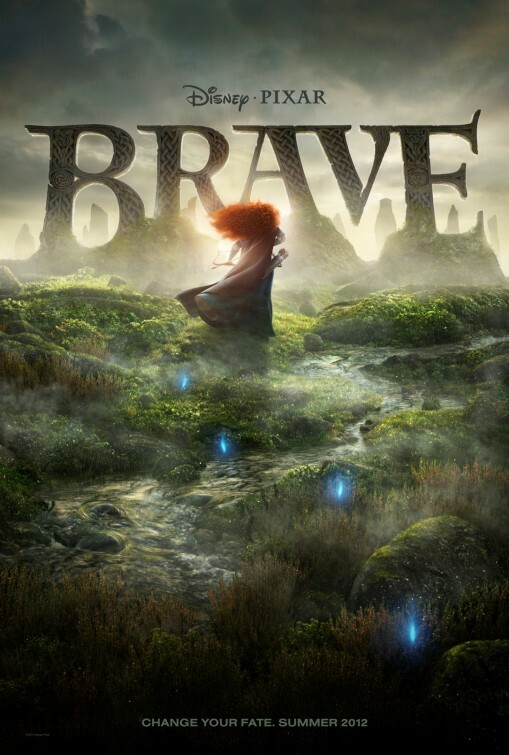 Pixar decided to fix this by making the lead character of “Brave,” the studio’s thirteenth feature, a woman. The main premise of “Brave” is that Merida (Kelly Macdonald) does not want to get married. Her father, King Fergus (Billy Connolly), is a little more willing to allow her to be her natural tomboyish self, but her mother, Queen Elinor (Emma Thompson), is concerned about the future of the kingdom and has been preparing her daughter for marriage since she was little. The lords of the land arrive to present their sons and Merida isn’t impressed and challenges them to an archery match. Through this, Merida shows she can do archery better than any of the potential suitors, humiliating her family and the lords. She then runs off and meets a witch (Julie Walters), who prepares a spell to change Merida’s fate. Merida feeds the spell-laden treat to her mother, turning her into a bear. They then run off to try to figure out how to reverse the spell while tensions brew because Merida needs a suitor. The movie would be much better if Merida wasn’t so annoying. Even at the end it’s difficult to care about Merida and her problems since she brings most of the upon herself by being confrontational and not willing to understand her mother. Additionally it isn’t until the end that Merida really realizes that she brought her problems upon herself. For most of the film Merida feels like her problems are the result of her mother wanting for her to get married. I would be a little more sympathetic if this wasn’t set in Scotland during the same period the Vikings existed and a girl who wasn’t even in her teens getting engaged wasn’t common place. After all, we’ve already seen a Disney movie during this blog post series that featured a woman being engaged to a prince at the announcement of her birth. What’s troubling about the movie is the use of anachronistic humor in the film. Humor that uses anachronisms can work, as seen with “Hercules,” but because of the tone of the film it seems very out of place. The two examples seen in the film both come from the witch when Merida and her mother visit the witch. The witch has left an away message in her cauldron that has options where you dump a vial to get a different message. This is reminiscent of menus anyone gets when calling a customer service number. When Merida dumps the vial for the message left for her, the Witch mentions going to the Wicker Man fest, which is either the Dark Age version of Burning Man or a festival where people yell “Not the bees!” at each other. Why either of those things would be mentioned in a children’s movie is beyond me. Wicker men were also part of Druid rituals, but even for a film studio that is prone to make obscure references in their movies, Druid rituals is pretty obscure. Also, most adults watching this movie would hear “Wicker man” and either think of the British horror film or the Nicholas Cage film. No matter how you slice this, I don’t know why the “Wicker Man festival” comment is made. Some of the jokes made in the film also tend to be a bit lazy. In the film we get a joke about haggis being gross and one of the lords lifts his kilt to insult the other lords. These jokes feel lazy because they’re jokes that have been seen in every movie and TV show that has ever had Scottish characters. But this is not the biggest problem with “Brave.” What ultimately makes this film problematic is the pacing. The big event in the film–the transformation of Elinor into a bear–doesn’t happen until halfway through the film. Everything before the film just leads up to that event. If you think about it, that’s 45 minutes of events that lead up the transformation which isn’t the slowest I’ve seen in a movie released by Disney, but that ends up feeling very slow. As a result, the quest to reverse the curse feels a bit rushed. But since this is a Pixar film we have excellent animation, particularly with the animation for Elinor. We have wonderful hair designs, especially with Merida’s red locks that bounce up and down as she rides on her horse. The Scottish landscape is wonderful to look at, such as whenever the characters are near water. The attention to detail is also very evident, such as the fabric in Elinor’s dress at the end of the film or the hairs on the chin of the witch. But is Merida a Good Role Model for Children? : No. I can see where some people would argue that because Merida is tomboyish and rides horses and shoots a bow and arrow that she’s a good role model. That doesn’t excuse her behavior in the film. Her behavior is in many ways similar to that of Ariel. In this situation, rather than being told by her father that she can’t marry a human, she’s told by her mother that she has to marry. This results in the same solution of going to a witch and asking for help. A difference is that all Merida knows is that she’ll change her fate with the spell given to her by the witch while Ariel is well aware of what she’s getting herself into with Ursula. That said, there is a clear transformation the character undergoes during the film. All of the stronger princesses I have examined or will examine feature this characteristic. I will give the filmmakers credit for this, but for most of the film Merida feels a bit annoying and also not a very compelling character. What’s even worse is that the conflict of not wanting to be in an arranged marriage feels better handled in “Mulan 2,” and I should not be able to say that I think a plot is handled better in a direct-to-DVD Disney sequel. At the beginning of Cars 2, the audience is treated to a spy and espionage opening where Finn McMissile (Michael Caine) comes onto a cargo ship in search of one of his operatives, Leland Turbo (Jason Isaac), who has gone AWOL. While there, he finds a glimpse into the devious plan of Professor Zundzapp (Thomas Kretschmann) before going away into a thrilling chase that is accompanied by Michael Giacchino’s exciting score. Unfortunately, the remaining 90 minutes of the film involves a Larry the Cable Guy vehicle that feels as if it is Pixar as written by the writers of a Shrek or Madagascar film. For a Pixar film, Cars 2 is crass and crude, lacking the sophistication of its predecessors. It is filled with bodily function humor that is mostly provided by Larry the Cable Guy and weird double entendres that are also mostly provided by Larry the Cable Guy, although anything about removing your fenders is now my new favorite euphemism. This would be completely fine if Cars 2 wasn’t also boring. One of the benefits of the first Cars film is that it wasn’t built around chase and racing scenes, like Cars 2 seems to be. With the previous film, the racing scenes were basically at the beginning and the end, save for one during Lightning’s time in Radiator Springs. Here, we have constant racing scenes that are followed by chases, then some down time, then some more action. The whole premise of the film is that Lightning McQueen (Owen Wilson) decides to compete in the first ever World Grand Prix, which is a huge publicity stunt for a new renewable fuel, Allinol. He decides to take his friend, Mater (Larry the Cable Guy), with him even though this seems like a terrible idea since Mater is absurdly annoying. Sure enough, Mater embarrasses McQueen in Tokyo and is sent off to the bathroom, only to end up being caught up in espionage after meeting Holley Shiftwell (Emily Mortimer). Hijinks ensue. A huge problem with this film is that it tries to be too much. It wants to be an espionage thriller for the whole family, but it also wants to be a feel-good buddy film and a film about cars and racing. Ultimately, the spy plot only works out with the plot about the World Grand Prix, so there is only one solution for how to fix the film: Get rid of Mater. The film seems to be more of a way of putting the maddening tow-truck in the spotlight while selling millions of dollars in merchandise. 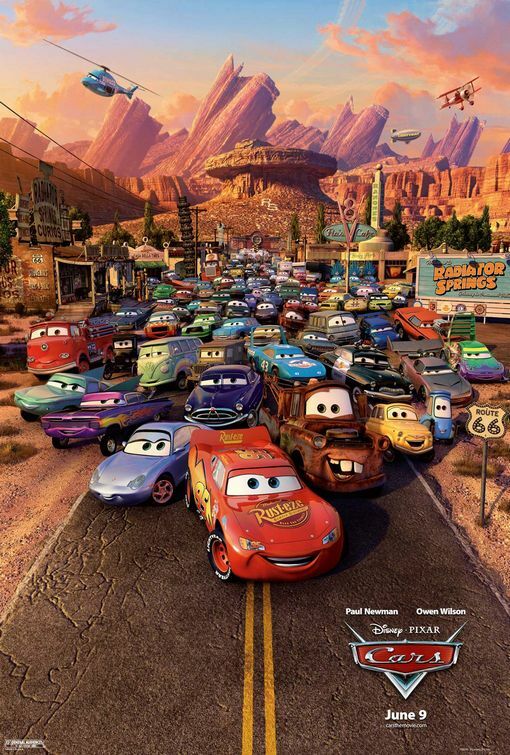 Mater was annoying in the first film, but he wasn’t as prominent in the film as Doc Hudson or Sally Carrera. Here, he seems to overshadow McQueen, which shouldn’t happen. Mater is possibly the most annoying sidekick ever created in a Disney film not because of his folksy ways, but because of how those folksy ways are portrayed by Larry the Cable Guy. He is the stupid redneck impressed by everything he sees. It’s a schtick that becomes tiresome quickly and his accent that sounds like a hyperactive Cletus Spuckler from The Simpsons. Throughout the film, you might find yourself hoping someone T-bones Mater simply because it would mean less screen-time for the character. But the film does have some redeeming factors since it is made by Pixar. It’s very pretty to look at, especially during the scenes where the characters are in Tokyo and Giacchino’s score is excellent, evoking the right classic spy sound. Unfortunately, that seems to be it. 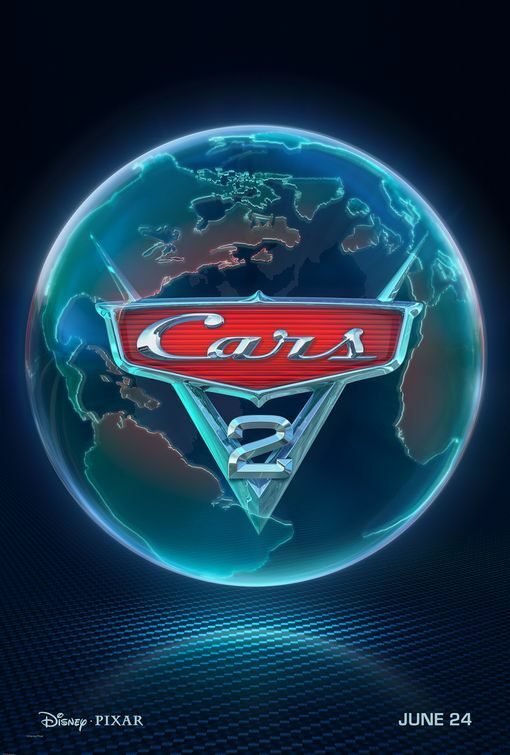 It would be nice if every Pixar film was wonderful, but this has proven to not be the case with Cars 2. The convoluted film shows that Pixar’s failure is caused by a film that is like so much out there. It is possible to create a great film with merchandising potential, as was seen with Toy Story 3, but that was not heeded with this film. At the very least, they probably sold plenty of merchandise tied into the film. For now, we are at the end of “The Films of Pixar” until I sit down and watch Cars 2 in November. (At least it will be better than Sucker Punch.) So how does Toy Story 3 hold up in the context of the Pixar filmography and in comparison to the other two films? 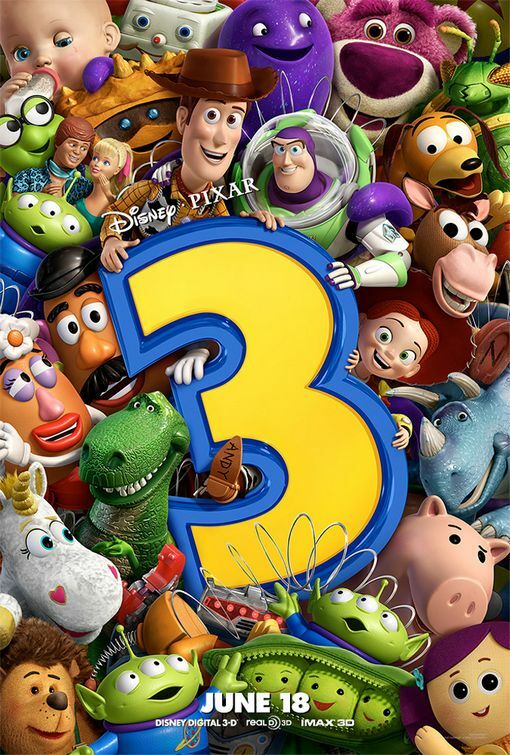 Toy Story 3 is the only film in the series that is not directed by John Lassetter and is instead directed by Lee Unkrich, who co-directed Toy Story 2, Monsters, Inc., and Finding Nemo. While the first two films feel very much like fun family films, the third film meditates on the themes of loss, abandonment, attachment, betrayal, and love. While it doesn’t match the accomplishment of Ratatouille, WALL-E, and Up, Toy Story 3 is still one of the best films Pixar has ever released. When the film starts out, we see the toys in a typical western scenario that blends all of Andy’s toys together. This is the product of a child’s fertile imagination and, as it turns out, a memory of the old days. Time goes on and the owner of the toys grows up to the point that he’s ready to head off to college. In an early scene, Woody (Tom Hanks) assembles the toys together in a toybox for “Operation Playtime.” They take a home phone and dial the number for Andy’s cellphone, which causes him to open up the toy box and not just touch them, hold at least one, Rex (Wallace Shawn). After Andy (John Morris) leaves the room, the toys exit the box and we discover that their ranks have dwindled. The only toys left are the main characters, Buzz (Tim Allen), Jessie (Joan Cusack), Rex, Hamm (John Ratzenberger), Mr. and Mrs. Potato Head (Don Rickles and Estelle Harris), Slinky (Blake Clark), and Bullseye. They are faced with the reality that Andy has grown up and doesn’t want to play with them anymore. When they arrive at Sunnyside, they’re greeted by a purple bear named Lotso (Ned Beatty) and a warm, colorful environment that guarantees they’ll be played with. Barbie (Jodi Benson) meets a Ken doll (Michael Keaton) and falls for him. Everyone thinks this is wonderful except for Woody, who is still determined to get home to Andy, however he is found by a girl named Bonnie (Emily Hahn), who takes him home and takes care of her other toys. Meanwhile, the rest of Andy’s toys find out that Sunnyside isn’t as wonderful as they expected and they try to fight the playtime hierarchy and Buzz being switched to Spanish mode. Toy Story 3 has one of the more complicated plots in the film and unlike it’s predecessor in the series, it doesn’t work very well without having seen the first two films. If this film is a person’s first introduction to the series, the loss of Andy as their owner and the other toys aren’t as affecting and Jessie being incredibly upset over being thrown out isn’t as understandable. The film’s structure still resembles the second film on some levels. Toys are taken to leave the house early in the film and at one point there’s a rescue mission and later a climactic battle scene. But this film handles these scenes better because of the stakes being higher for the characters. In Toy Story 2, the stakes are relatively low for them. In storytelling, raising stakes for characters can do wonders because it gives them more of a motivation for their actions and consequences for their decisions and what happens. In Toy Story 2, Andy is still young and even if Woody or Wheezy is gone, they’re still together and Andy will be there for them. It could be argued that there are higher stakes for Woody, but lower stakes for the rest of the toys. In this film, that environment isn’t there. They’re desperate for affection and attention and completely aware their days are numbered. Almost all of them come close to being thrown out at one point and end up in the destination later in the film, the equivalent of death for a toy. Oddly enough, the fact that the toys seem to have nothing left to lose is what makes their situation harder for them because—except for Jessie and Bullseye—this is the first time they have an owner that isn’t Andy and won’t give them the same treatment. This is the first Toy Story film where a happy ending doesn’t seem guaranteed and the question of what would be a happy ending is left out there. Clearly, returning to Andy isn’t an option and the environment of Sunnyside is the equivalent of a prison where the new toys are put in the worst place possible to test their endurance. Paradise is a journey for the toys and difficult to find because even when it starts off the place they know as home isn’t for them any more. The most striking thing about this film is what has been done with the antagonist. In the first two Toy Story films, we are told that the antagonists are just that way and have always been. Sid is evil, Al is greedy, Stinky Pete is bitter, and Zurg was born programmed that way. Lotso has an exterior of being a sweet, cuddly bear, but is an authoritarian leader of the daycare. But unlike the other antagonists, he wasn’t always that way, and there is a reason for the change. In a flashback, we find out that Lotso was left behind by his owner with two other toys. After travelling back to the house, he sees that he was replaced after assumed as being lost. He takes this to mean they were replaced and their owner never loved them. For Lotso, toys are abandoned because their owners fall out of love with them, maybe meaning they never loved them. For him, this matter is black and white because if someone loved them, they would never grow up, mature, and stop loving them. Woody sees that Andy loves them and always loves them, even though he has stopped playing with them. Meanwhile, there’s Jessie who has been abandoned by one owner and acknowledged that at one time Emily loved her. Her initial reaction is what is mistaken as Andy throwing them out is just a repeat of Emily dumping her on the side of the road. For Jessie, the matter is that an owner can love a toy at one point stop loving them, which is still painful. Not only is Lotso a complex villain, he’s also a third perspective in the drama of what happens when toys are left behind or donated. Finally, the advancements in Pixar’s animation are evident in this film. All of the humans look realistic and we see the individual strands of their hair move as they walk or bounce along. There’s more detail and dramatic lighting in this film, particularly in the climactic scene that takes place in a landfill at night. The lighting also affects the atmosphere of the environments. At night, Bonnie’s house still seems bright and inviting while Sunnyside looks more menacing and has a prison-like feel. What makes Toy Story 3 work so well is how it deals with the characters and grows them. It doesn’t send them off on a crazy adventure, but instead puts them in a different world with a different reality to face. Toy Story 3 isn’t as mature or beautiful as Ratatouille, WALL-E, or Up, but it still examines complex ideas through a toy’s viewpoint. Pixar managed to make a fantastic film that would sell millions of dollars in merchandise, but they gave it a heart and told a well thought-out story. After all, Pixar is known for telling stories with terrific characters, lots of emotion, and fantastic animation and that is what will keep them around for several years. 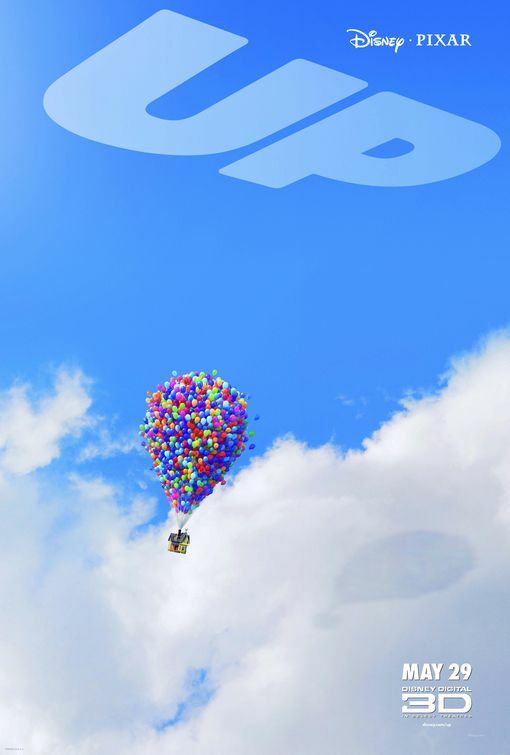 In 2009, Pixar did something remarkable and released a film that would have almost no merchandising and licensing potential, but would cause numerous adults throughout the country to bawl during the first ten minutes of their tenth feature film, Up. Up is Pixar’s masterpiece, providing a touching, thrilling and moving story and one of the most heartbreaking sequences ever seen in an animated film. In addition, the film was the first Pixar movie to be released in 3D and since I saw it in theaters for a 3D showing, I can say that they managed to use what all too often seems like a fad and turn it into a way to deepen the images of the film, such as the house floating through the clouds. Now Carl lives in the house he met Ellie in, which they both fixed up and painted. Surrounding him is construction and developments of modern businesses, encroaching on his house where he lives quietly, never seeming to leave the property. The developer is willing to buy the property from Carl, but he insists that the house can be torn down only after his death. Meanwhile, an eager Wilderness Scout named Russel (Jordan Nagai) shows up at Carl’s door, wanting to help him in order to earn his Assisting the Elderly merit badge. Carl sends the boy to go find a creature under the house. Shortly afterwards, the mailbox outside of the house is damaged and in a fury over the damaged mailbox and the construction worker’s carelessness, Carl injures the man. After this outburst, he is evicted from the home and told to live in a retirement home. While packing he discovers Ellie’s “Adventure Book” and comes up with a plan to get the house to Paradise Falls as well as keep him out of a dreaded retirement community. He inflates thousands of brightly colored helium balloons and tethers them to the house, causing the house to lift up off the ground and sail through the sky. While floating, Carl hears a knock and finds that Russel is a stowaway who is allowed to join him on the trip. After a tumultuous trip where the house travels through lighting, the find Paradise Falls, as well as talking dogs—mainly Dug (Bob Peterson, the films co-writer)—exotic birds (Pete Doctor, the film’s director and other co-writer), and Muntz himself. It would be hard to argue that Up isn’t at least one of the greatest films Pixar has ever made. With the small characters, they all have many sides to themselves. When we first see Carl after the short, emotionally devastating prologue, he has become hardened and bitter by the absence of Ellie, a personification of the grumpy old man. But in the first twenty-five minutes of the film, there’s plenty the audience sees of Carl to see that he isn’t just an acerbic elderly individual. Once there was a spirit of adventure that thrived in the his soul, causing him to one day finally buy tickets to South America for him and Ellie, and that thirst for adventure is what causes him to use the balloons to fly. Russel, although a hyper individual, is persistent, brave and loyal to the point that he is willing to go find the animals the two meet in Paradise Falls without Carl’s aid. Similarly, the same could be said about Muntz, who seems admirable, but is ultimately a very dark character in the film. None of the main characters are one-dimensional and Dug does not come across as an annoying sidekick that would entice children to see a movie where the protagonist is a cantankerous old man. But there is more to this film that makes it wonderful than just the characters. There is of course the magnificent animation that transports us to exotic South America, and the array of vivid colors that are reflected on the walls of a girl’s bedroom as the house floats by after take off. The animation is something that by 2009 everyone had come to expect of Pixar, although it is still worth recognizing. What really makes Up soar—no pun intended—is Michael Giacchino’s score for this film that has a recurring waltz motif that is first heard during the prologue. For the four minute montage showing Carl and Ellie’s life together, his score is the essentially the only sound heard during the sequence, but provides more emotion than any dialogue possibly could. The more remarkable aspect about the score is how the theme comes up in many different forms and never feels over used because of the orchestrations finding the right balance of instruments so in some more moving sequences a piano is all that is used, while a fuller orchestra is used in others. And with a film that the image primarily associated with it is of a structure flying through the air, the light score works perfectly for the film. Up might be one of Pixar’s most Fantasy-like films because of the premise involving a man who ties balloons to his house and causes the structure to fly him to South America. That does not matter with the beauty and emotion presented in the film. In fact, Carl tying balloons to his house is what can help fuel dreams of adventures just like Muntz did for the young Carl and Ellie. What Up shows us is even when we’re alone and want to stay that way, there is adventure out there and we are never too old for it. What if our waste and perpetual need of material goods caused us to leave earth because of how uninhabitable it had become? How would we clean up Earth? Who would be left behind to inhabit our planet? How long would it be before we could return? This is the world presented to us in Pixar’s masterful ninth film, WALL-E. While a previous film, Cars presented us a world lacking humans and not explaining to us why they aren’t here, we are told clearly why humans don’t live on Earth in 2805. A little less than 100 years from now, megacorporation Buy-n-Large has decided to move humans away from Earth in spaceships while Waste Allocation Load Lifter—Earth class robots, or WALL-E’s, are left on earth to clean up. But 700 years later, there’s only one robot left on earth, a WALL-E unit (Ben Burtt) who has developed a personality as well as a love for the film version of Hello, Dolly!. One day, a large technologically advanced spaceship lands on Earth and an Extraterrestrial Vegetation Evaluator robot, or EVE (Elissa Knight), emerges with a directive to see if there’s any sustainable life on Earth. WALL-E instantly falls in love with her, even though she fires a plasma gun at him. When EVE discovers a plant WALL-E has put in an old boot, she closes up, seemingly lifeless. WALL-E cares for her until her ship comes, which he latches onto, following her up into space where we see that earth now is surrounded by stationary satellite pollution. EVE’s ship is docked on the ship Axiom, where robots do most of the work while humans, who are now morbidly obese and have suffered bone loss, lay back on their motorized chaise lounges, where they use screens to video chat with people right next to them. While on the ship, EVE has to get the plant to the captain (Jeff Garlin), who does almost nothing, which will allow for the passengers to return to Earth thanks to proof that the planet is inhabitable once again. However, the ship’s autopilot, Auto (MacInTalk), has a HAL-like personality that derails the plans. 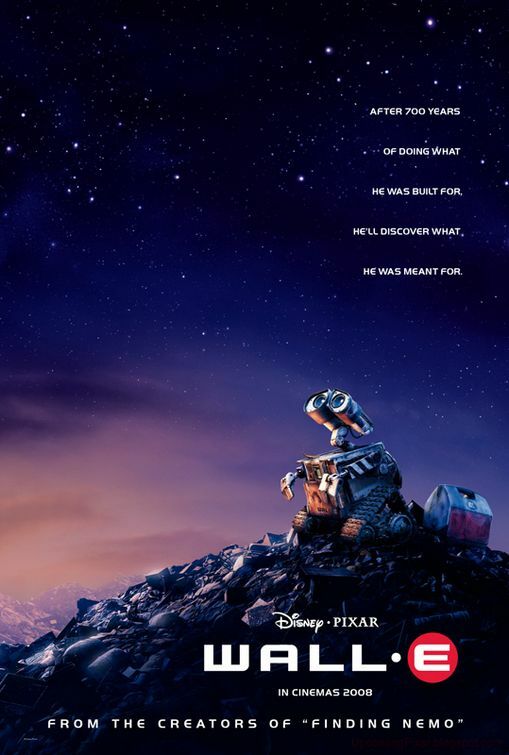 WALL-E was Andrew Stanton’s second film for Pixar, after Finding Nemo and once again a level of beauty is brought to the animation as we see the decay of Earth as a result of its transformation into a massive landfill where WALL-E goes around compressing the trash while collecting various odd items. There’s also the sleek, perfect design of EVE, a contrast to the boxy, grimy appearance of WALL-E, although EVE’s sterile appearance is no doubt the result of having originated on the Axiom, while WALL-E has been on Earth for about 700 years. The interior of the ship manages to both look like a futuristic city, similar to Tokyo, while resembling the interior and exterior of cruise ships, at least based on my experience on a cruise ship. But the most magnificent scenes are those that take place outside of the ship, in space. Here, we see WALL-E touching the ring of Saturn, or him and EVE dancing outside of the ship in a beautiful dance that manages to both seem choreographed and spontaneous. From the moment this film begins, with what is my favorite opening for a Pixar film that doesn’t result in me sobbing—in this film, a camera flies around space before entering earth where we see WALL-E at work as “Put On Your Sunday Clothes” plays—to the end, we’re given a very original, thoroughly beautiful, moving film that manages to simultaneously give us a glimpse of our potential future as well as show us how beautiful the connections made by two beings can be. We see this both through WALL-E and EVE, as well as John (John Ratzenberger) and Mary (Kathy Najimy), two humans on the Axiom who meet each other face-to-face after encounters with WALL-E and discover the joys of splashing in the ship’s pool, which they didn’t know of. Even with the grim future presented as a result of mass consumption and waste, any potential message that could be gathered from this film doesn’t feel didactic. It seems secondary to the story and mostly an explanation as to why WALL-E is the last robot left on earth and humans have left. Perhaps Pixar entered a golden age during the period where Ratatouille, WALL-E, Up, and Toy Story 3 were released. All four of those films have strong stories and images, focusing on our condition and conflicts. While one of those films was very easy to merchandise, all of them come across as having been made to tell a story. Particularly with WALL-E and Up, those films succeed at doing so. John Lasseter’s film Cars is a love letter to the automobile, Route 66, and auto racing, primarily NASCAR racing. However, Cars is not that beautiful of a love letter. Between the dragged out plot, the inclusion of Mader the Tow Truck and details that sometimes become repetitive, Cars is like a love letter that includes the wrong metaphors and similes, causing an unintended response of annoyance. Lightning McQueen (Owen Wilson) is a hotshot race car that has managed to make a three-way tie between “The King” (appropriately Richard Petty) and Chick (Michael Keaton) for the Piston Cup. In order to determine who is the winner, the three cars must travel to Los Angeles to compete for the cup. On the way there, Lightning falls out of Mack (John Ratzenberger), his car carrier, and ends up traveling down a dusty desert road before attempting to make it back to the interstate. He ends up in the tiny town called Radiator Springs, where he tears up the road. The sheriff (Michael Wallis) arrests him and the morning after his accident, Doc (Paul Newman) orders Lightning to repave the roads. As he struggles through this task, he meets Mader the Tow Truck (Larry the Cable Guy), Sally (Bonnie Hunt), the town lawyer; Luigi (Tony Shalhoub), Ramone (Cheech Marin), and Flo (Jenifer Lewis), denizens of the town that grows on Lightning as racing fans panic over his location. But there’s an even bigger problem with this film and that is the existence of Mader. In previous Pixar films, celebrities inhabit the roles they voice to the point that you don’t see it as Tim Allen as Buzz, but just Buzz Lightyear. Here, we are presented with the tow truck version of Larry the Cable Guy, easily the most annoying sidekick ever created in an animated film. He’s dim, he tries to hard to make a joke, he is crude with jokes that will only be caught if you’re an adult and pay attention to the film. For example, there’s this part of the dialogue. Lightning: He has three Piston Cups! Mader: He did what in his cup? Although that is a little more clever than the crude jokes present in the CGI films of Dreamworks, it still feels out of place in a Pixar film. Meanwhile, Larry the Cable Guy feels like he was added in here to attract a new demographic. There doesn’t seem to be any other reason for his character to exist than that. But there’s still lovely animation and a wide array of cars on display in this film. That doesn’t mean that it’s worth a viewing. At a few minutes short of being two hours long, the film is desperately in need of a trimming, which would probably make it more interesting. Or maybe it needed some deeper character interaction than Lightning falling for Sally or discovering Doc’s secret. Cars is an incredibly flawed film where it’s hard to figure out what the problem was. It’s clear that there were good intentions with this film, but good intentions does not mean that a product is ever good. At the very least, the film made a lot of money for Disney with merchandising and licensing. Towards the end of The Incredibles, a little boy on a bike proclaims, “That was totally wicked!” referring to a big battle he’s just witnessed between the villain and the superhero family at the center of this film. The same sentiment could be shared by one that has just finished watching The Incredibles. 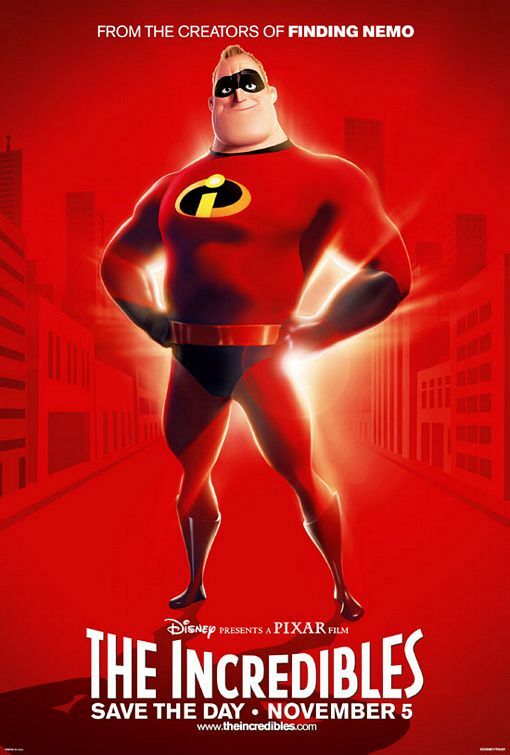 Brad Bird’s second film follows the Parr family, a family of superheroes made up of Bob (Craig T. Nelson), or Mr. Incredible; Helen (Holly Hunter), or Elastigirl; Violet (Sarah Vowell), Dash (Spencer Fox) and Jack-Jack (Eli Fucile and Maeve Andrews), who seems to not have any superpowers at the start of the film. Several years before most of the action of the film, superheroes were forced to go into hiding due to mounting public anger and lawsuits against superheroes, notably Mr. Incredible. But in the time of the film, Bob is working at an insurance company, still trying to save people by finding ways to help them get around the system and listening to the police scanner with his buddy, Frozone (Samuel L. Jackson). After Bob is fired from his insurance job, he is pulled back into the superhero world after receiving a message from Mirage (Elizabeth Peña), which results in a visit to Edna Mode (Brad Bird. Yes, Brad Bird.) for a repair to his old suit and a new suit. Helen eventually gets suspicious and Bob finds out that the person he’s helping is a former fanboy, turned villain, Syndrome (Jason Lee). In order to save the world, the family has to band together. The major thing about The Incredibles is that it was the first Pixar film where a the entire main cast was made up of humans. As a result, we see how the animation of hair, fabric, character expressions, and the facial structure of humans has changed for the animation studio. For this film characters run, jump, float, swim, all of which has some effect on how they’re animated. We see how realistically the hair of the characters reacts when someone goes underwater. Violet’s black hair is animated so we see portions that have a blue tint to it. Syndrome’s hair that resembles a flame moves slightly with his head, although staying fairly stationary like a well spiked head of hair. With fabric the details of suits and the reflection and fit of the fabrics is figured terrifically, allowing the characters to look more human. But there’s more than just the animation that makes this such an awesome movie. There’s the struggle the characters face between their nature and what the world forces them to be. This is no different from the Iron Giant’s struggle to be a weapon or to be Superman, or Remy’s struggle between being a garbage picking rat or a chef. What makes this struggle interesting is how the characters deal with this. Bob is constantly trying to save people, which makes it understandable as to why he is pulled back into the life of a superhero. From what we see, Frozone—whose real name is Lucius—is only drawn to saving people because of Bob’s pressure until the end of the film when a large threat attacks the city. Helen seems to have retired from saving the world and is only drawn back in because she wants to see what her husband is doing—although Edna creating matching outfits for the family might have helped. As for the children, they’re aware of their powers and use them to pull pranks, hide from a boy they like, or make family dinner really interesting. They know they’re not normal, but they’ve never had to deal with the life of being a superhero because of the supers being forced into hiding. But then there’s the villain, Syndrome. He’s always wanted to be a superhero but is rejected as a sidekick for Mr. Incredible who says, “I work alone.” To achieve being a super, he creates gadgets such as rocket boots and a cuff that does numerous tasks. To become what he once idolized he has to become evil, a concept that does not escape Syndrome. The final aspect that ties this film together is Michael Giacchino’s score that is filled with an almost James Bond feel to it. There’s something that is simultaneously classic, fresh and exhilarating to his score that is filled with trumpets, horns and saxophones. If you haven’t seen The Incredibles, you must. There’s something for everyone. Action, romance, marital problems, betrayal, kids being awesome and helping save the day. But like most Pixar films and all Brad Bird films, there’s a fascinating display of how people behave in situations and the internal struggles we face.